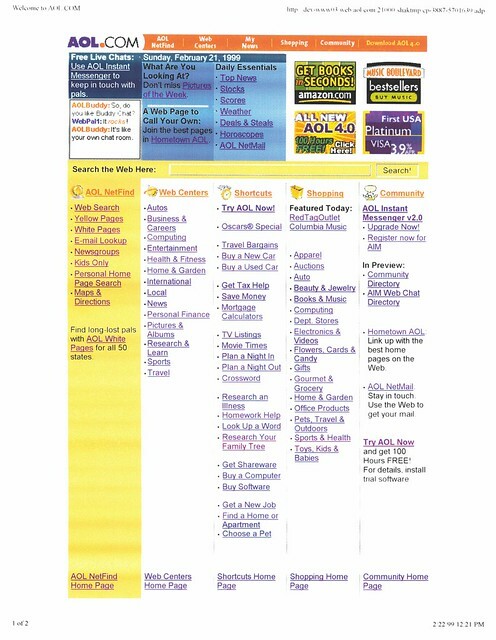 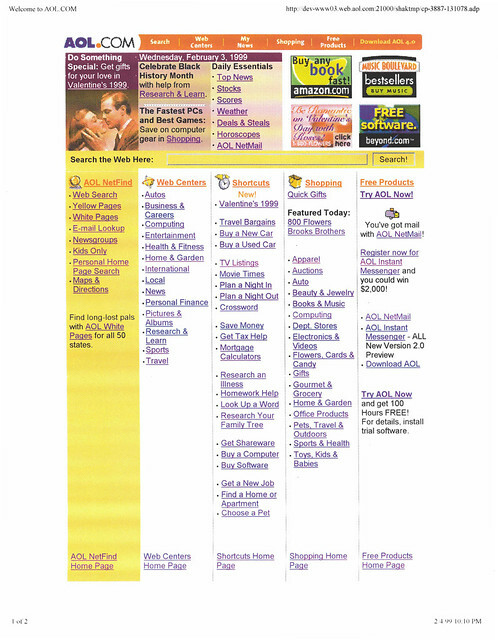 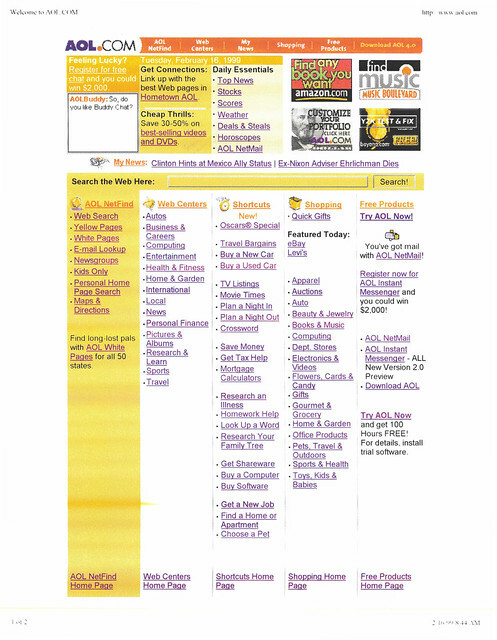 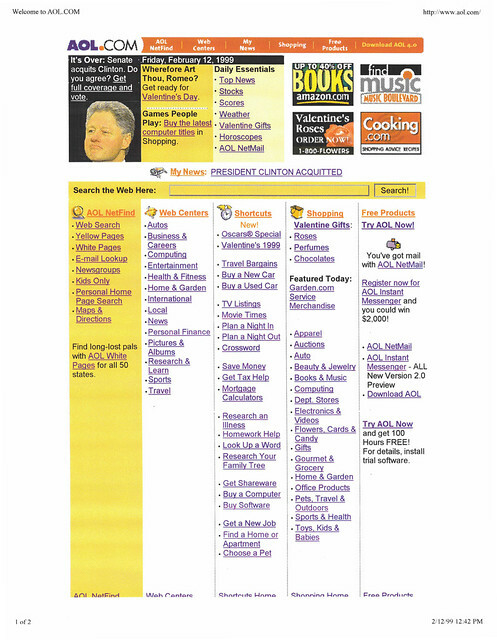 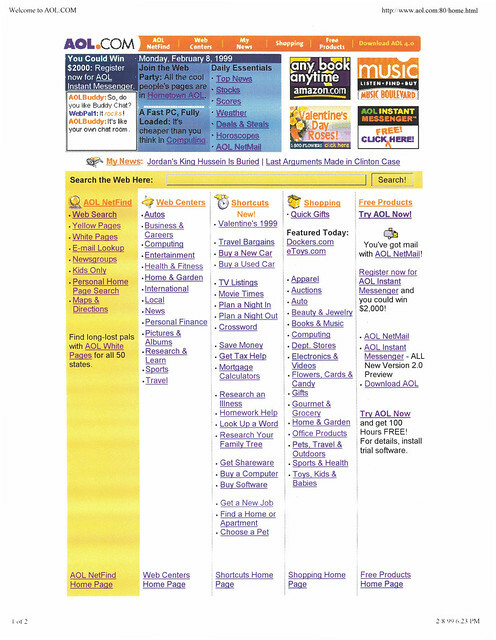 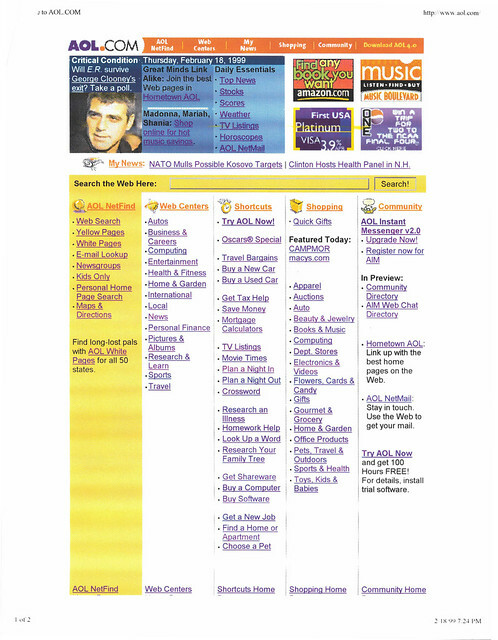 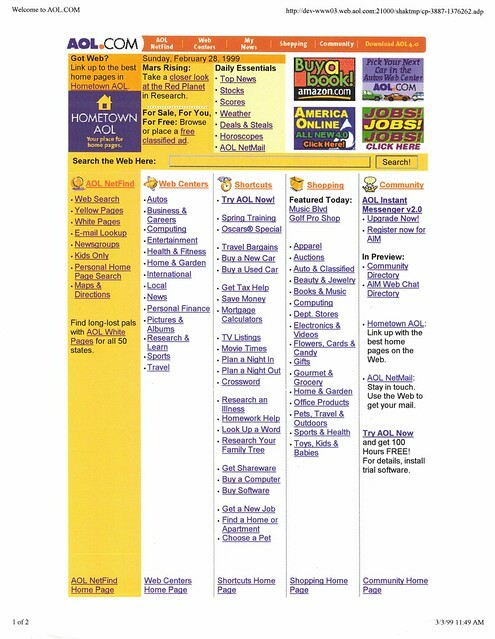 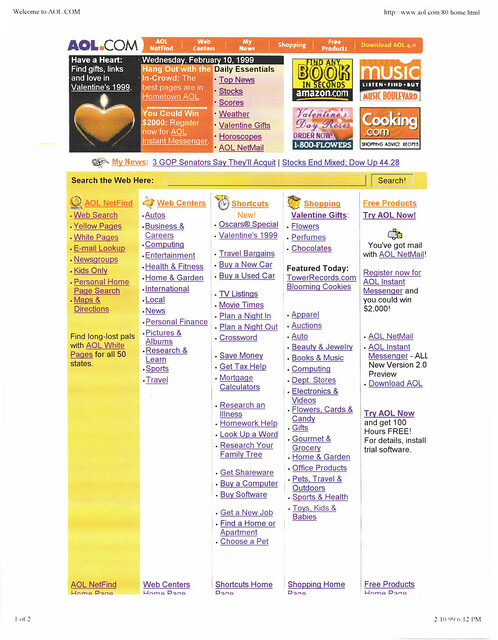 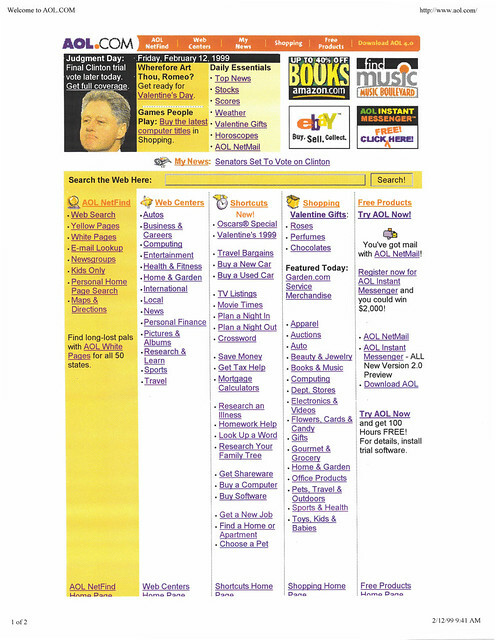 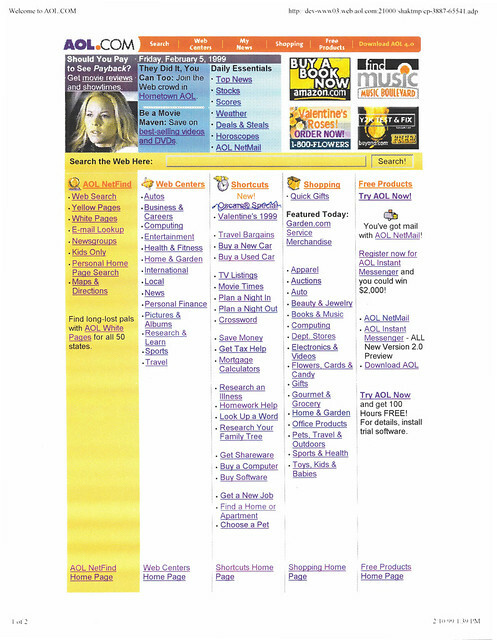 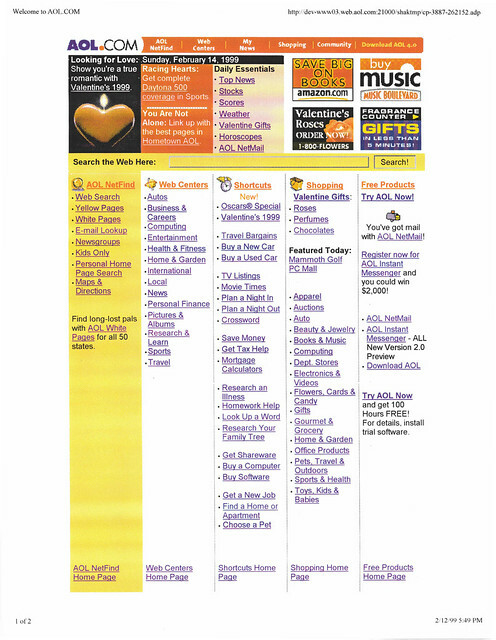 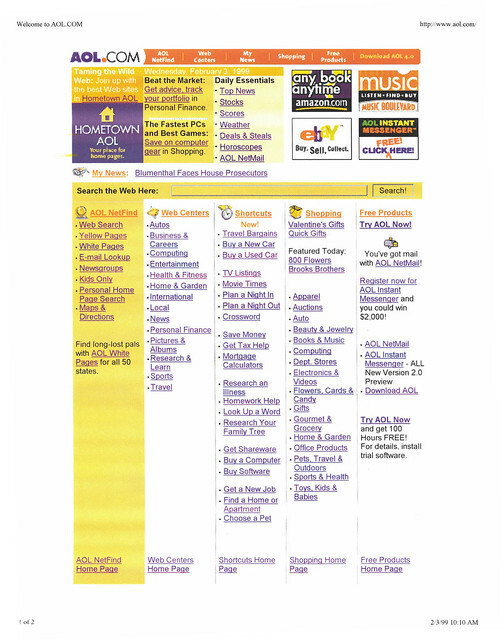 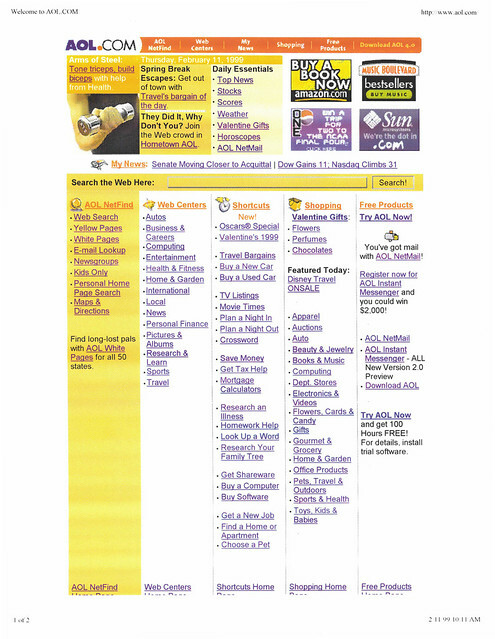 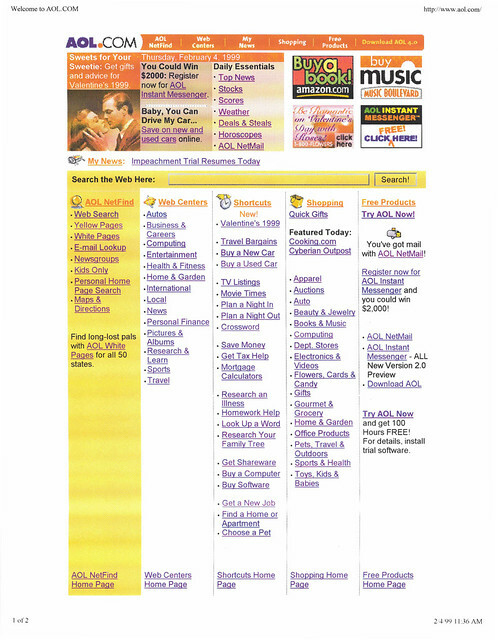 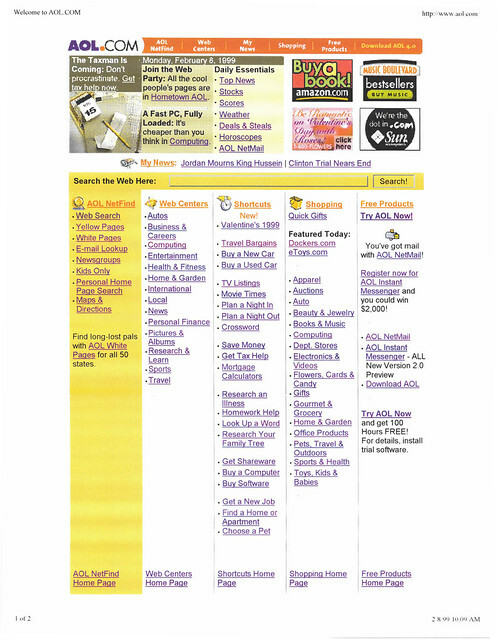 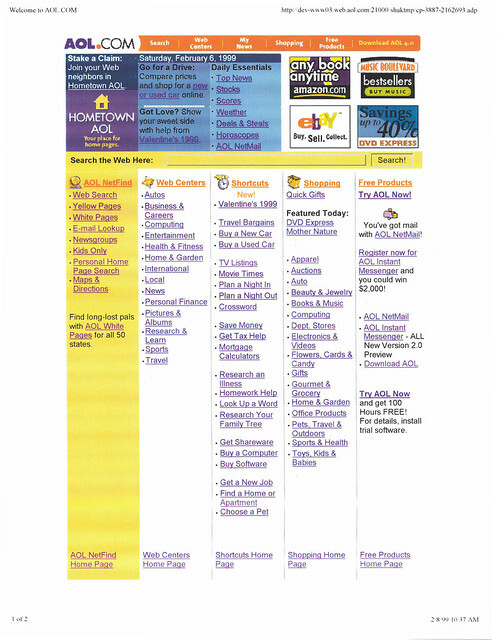 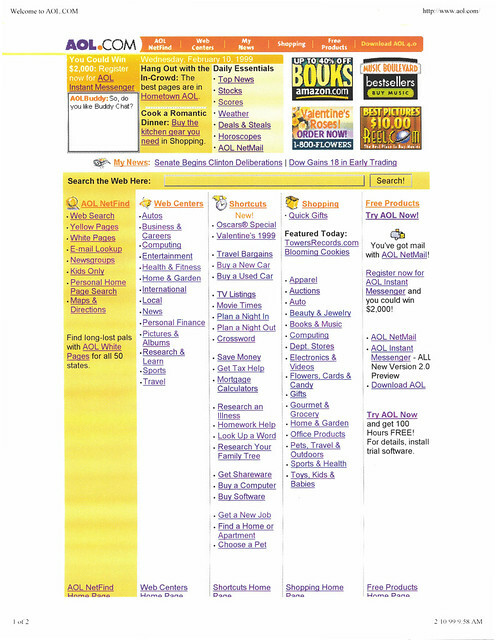 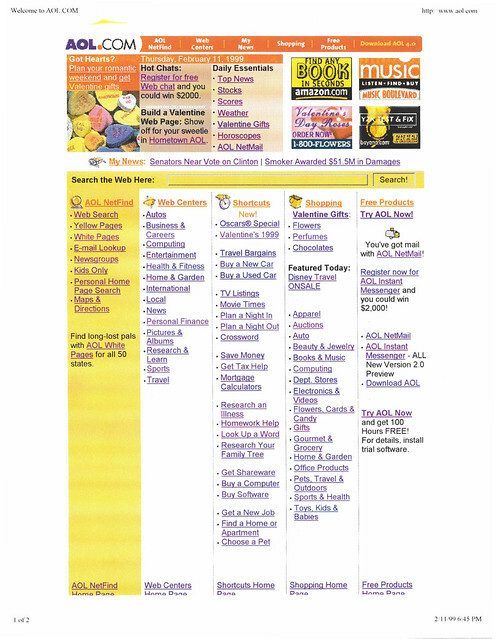 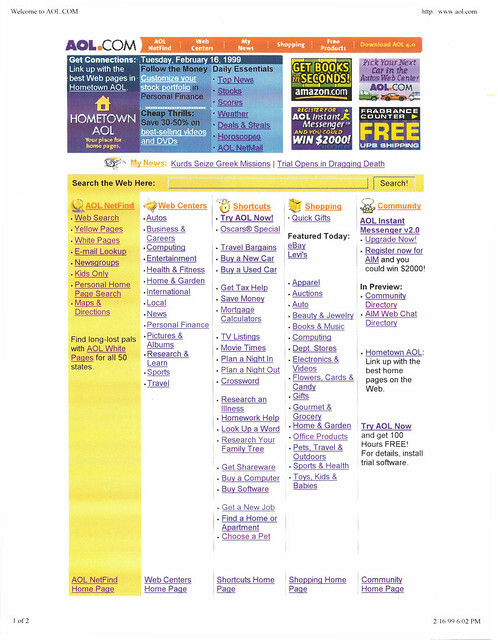 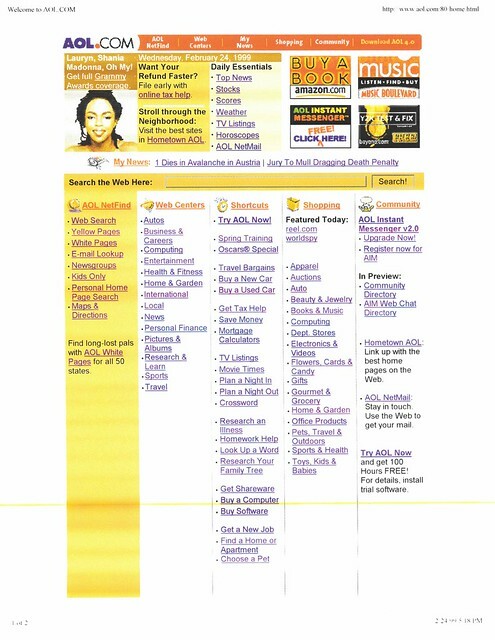 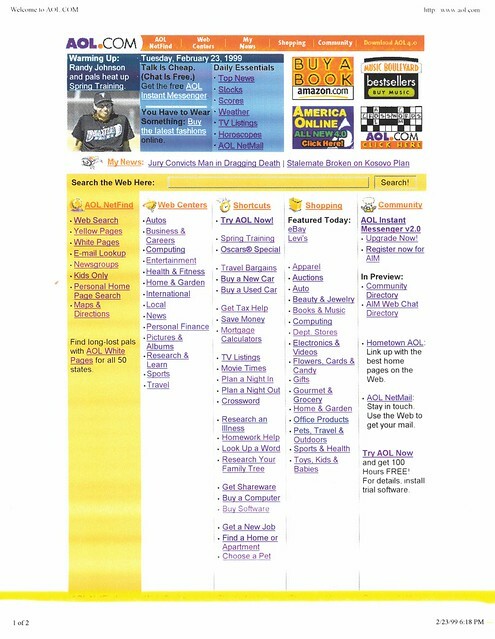 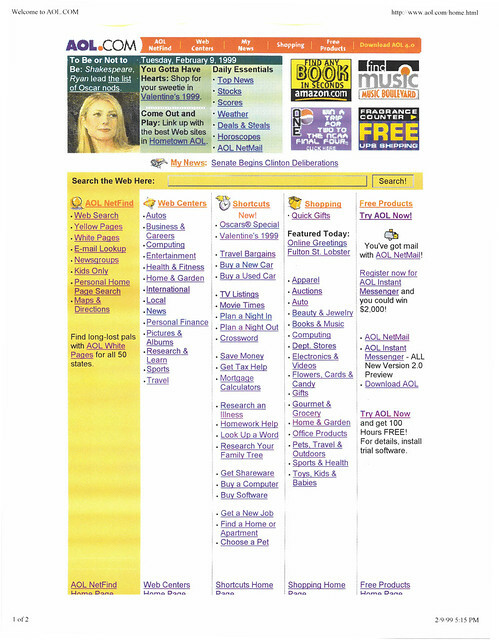 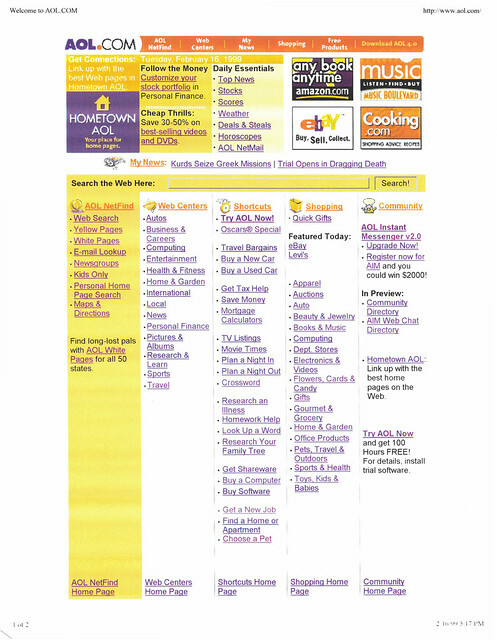 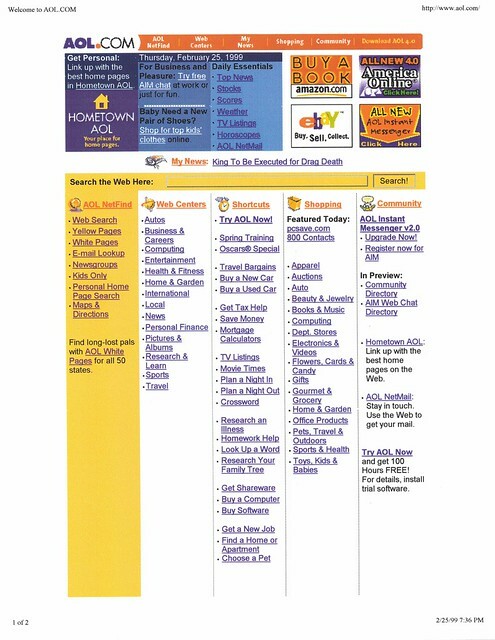 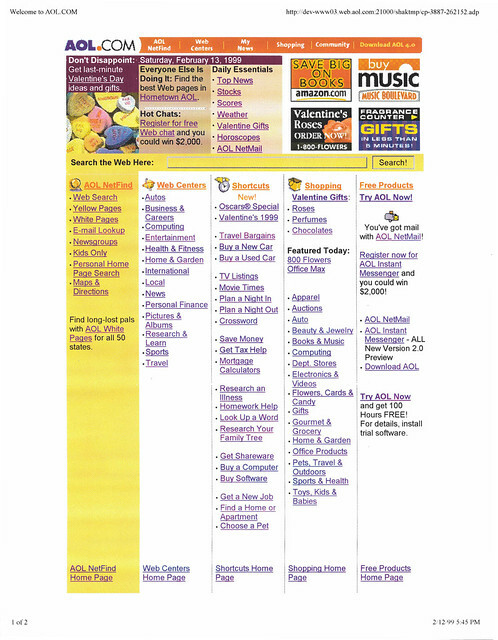 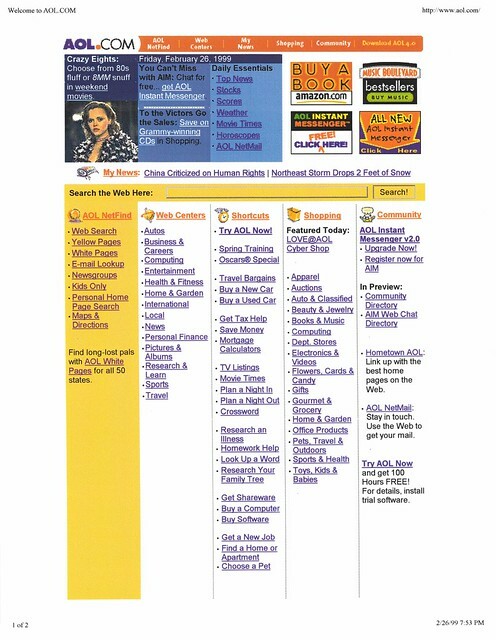 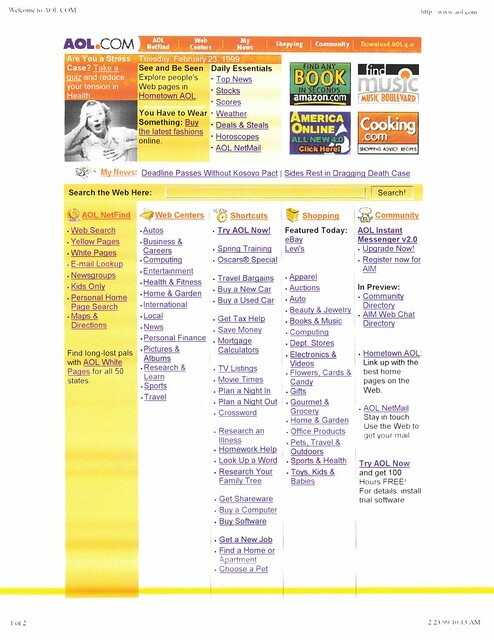 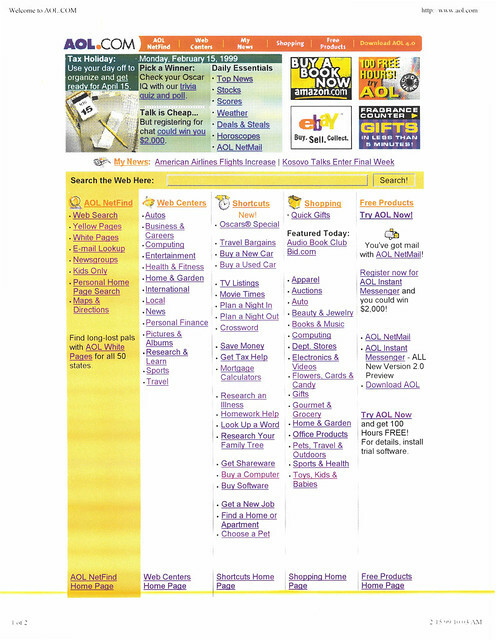 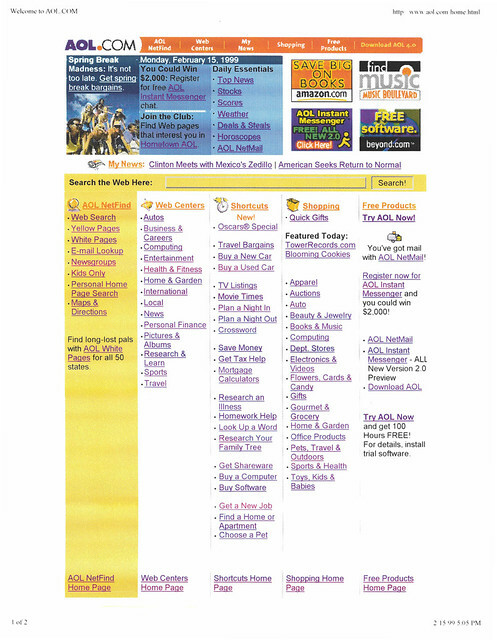 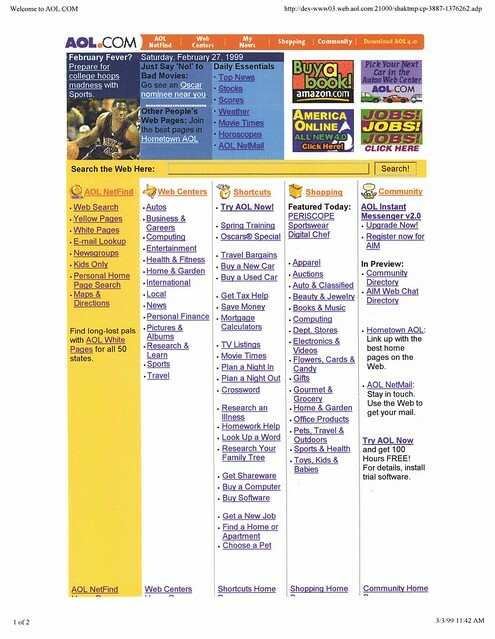 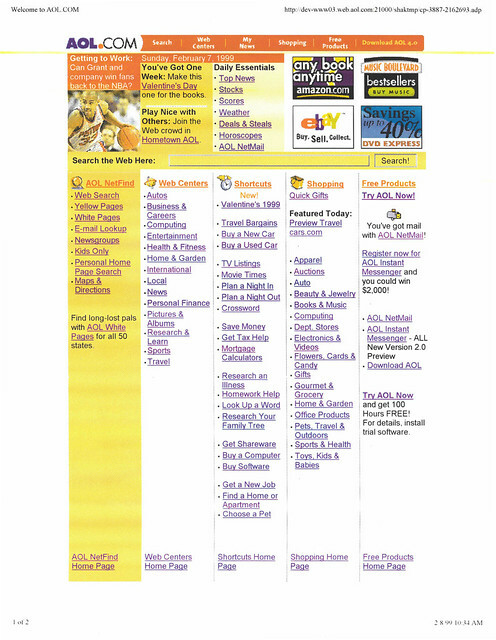 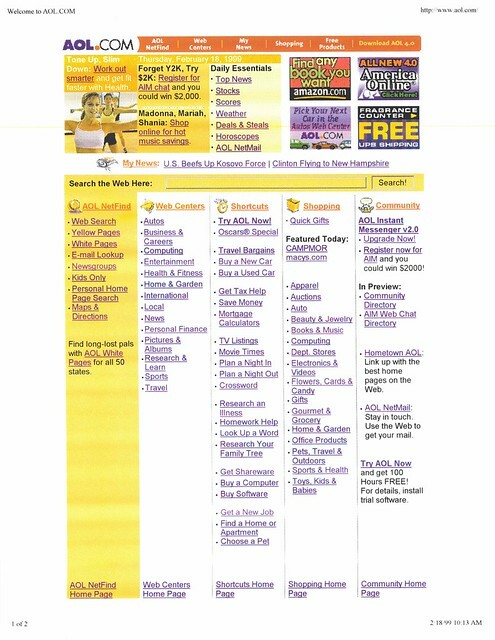 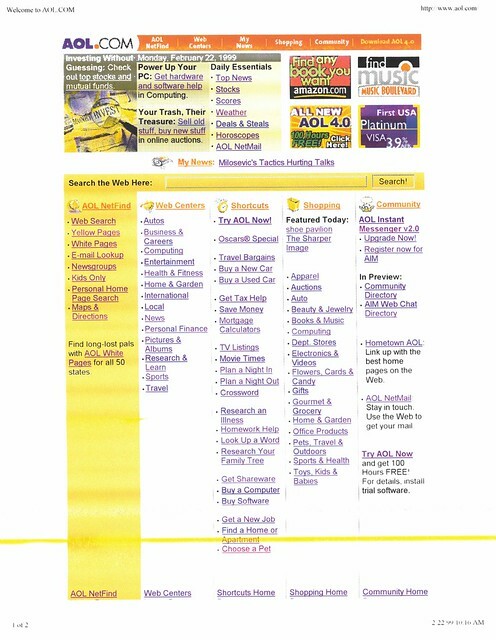 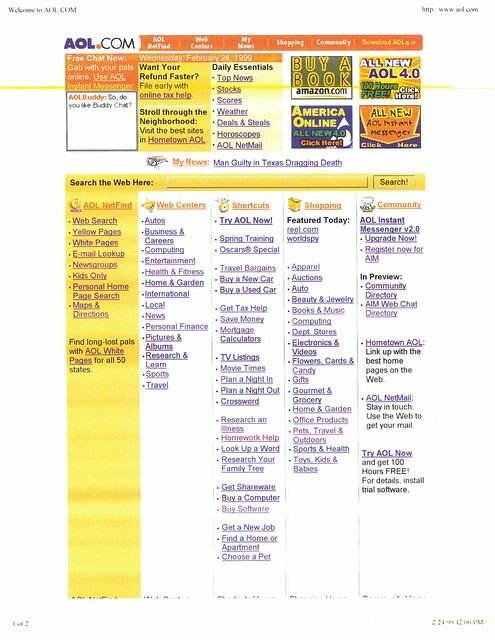 20 Years Ago on AOL.com: Feb. 26, 1999 -- AIM and "200 Cigarettes"
Then, in the PM update and a reversal in the usual way of things (that is, featuring Entertainment stuff on weeknights), we switched to the standard purple-and-gold Hometown AOL promo. 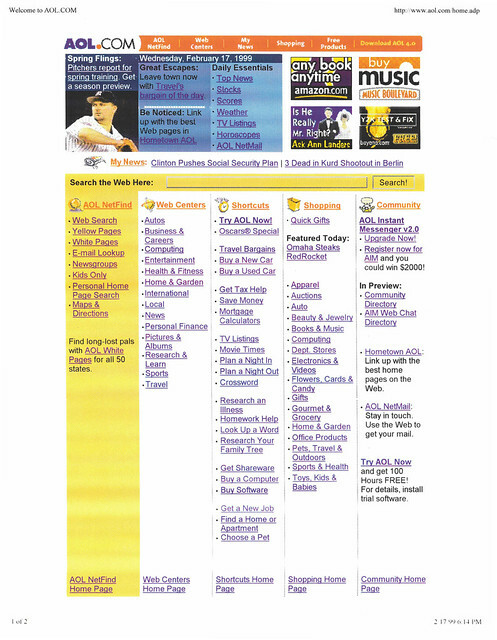 20 Years Ago on AOL.com: Feb. 24, 1999 -- Why Were the Grammy Awards on a Wednesday? 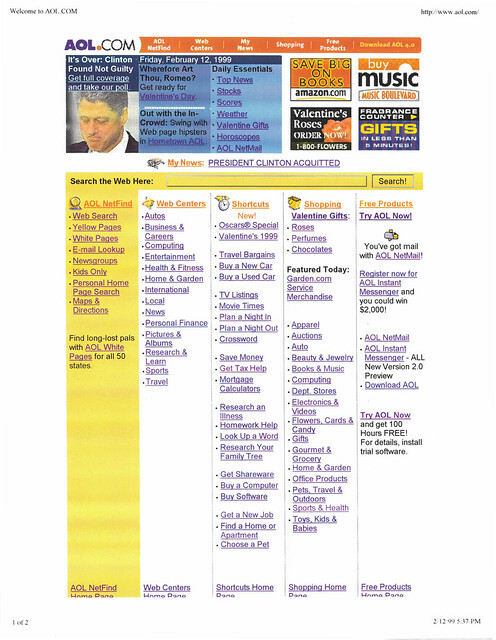 ...the PM update, where tech stocks apparently had a good day. 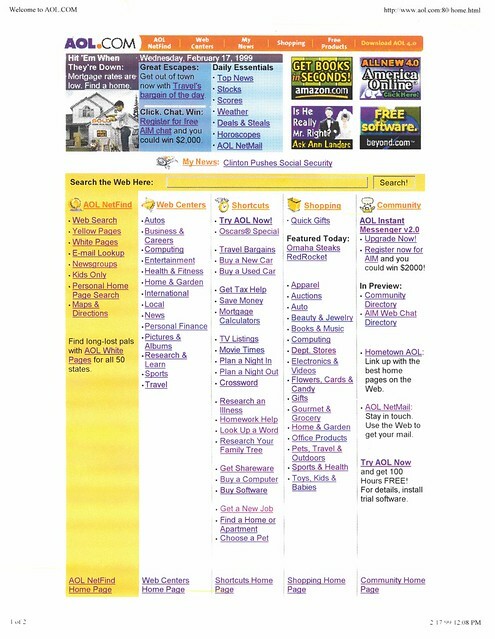 A Nasdaq panel voted against trading halts for the Nasdaq, which were seen as a way to help protect small, individual investors—many of whom were new players thanks to online brokerage firms. 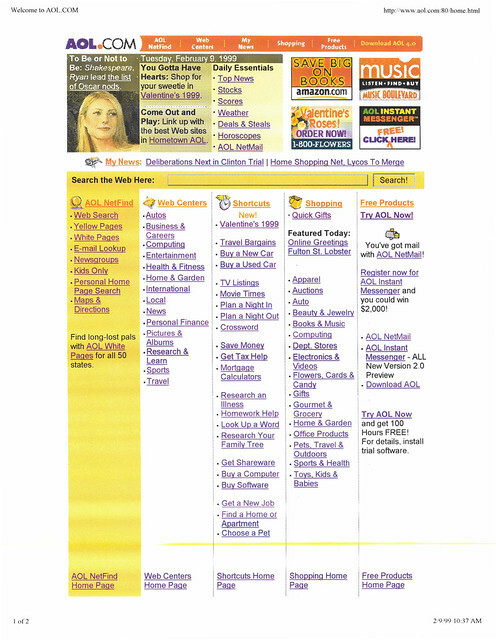 Irony alert: Quoted in the article: "Bernard Madoff, head of a trading firm that matches buyers and sellers on Nasdaq who supports the use of halts, predicts they will be approved eventually but says they won't be a cure-all. 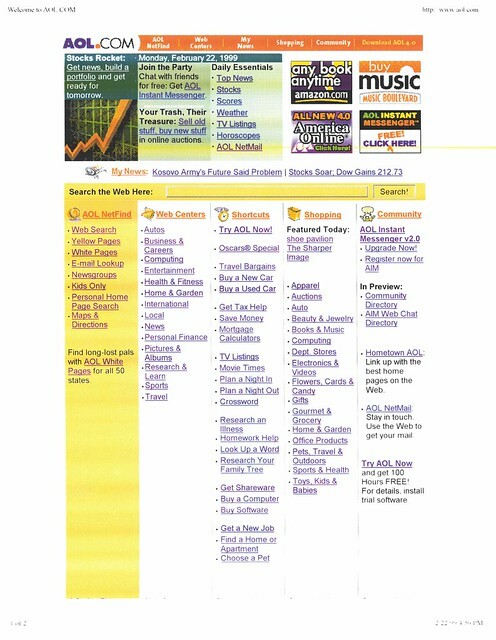 'The halts aren't going to cure volatility, they're just going to limit it,' he told CNNfn." 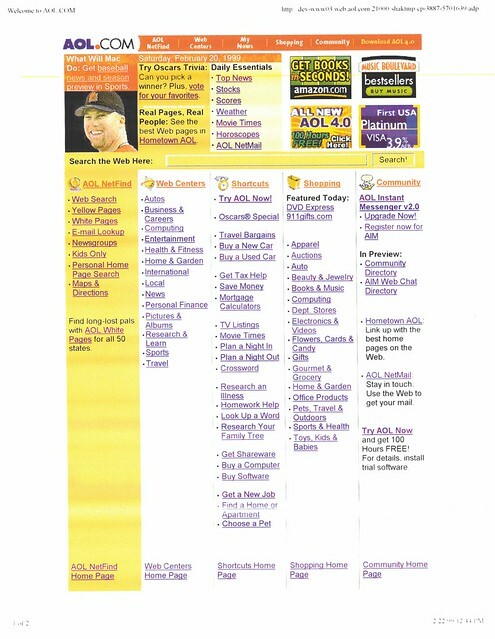 20 Years Ago on AOL.com: Feb. 20, 1999 -- What Will Mac (Mark McGwire) Do? 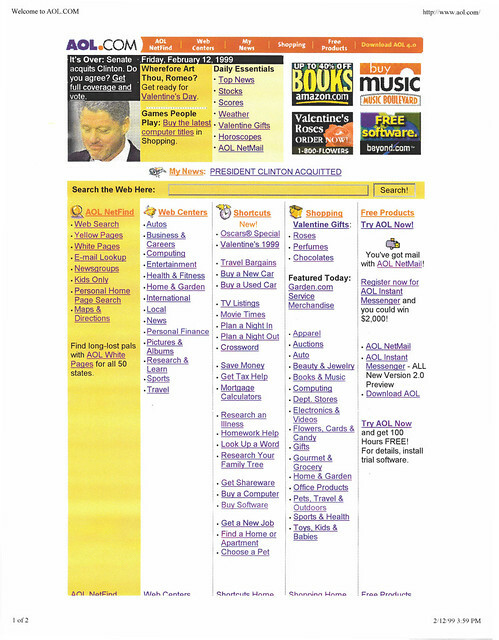 February 20, 1999: We went with a Saturday sports promo with a baseball season preview featuring Mark McGwire, posing a semi-rhetorical question without realizing that the answer 20 years later would include, "not get inducted into the Baseball Hall of Fame because his career was built on a foundation of performance-enhancing drugs."